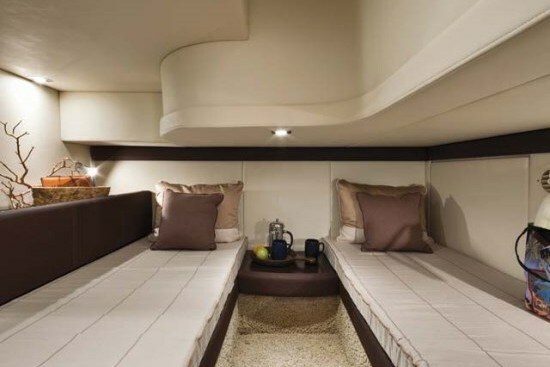 Let’s step aboard the molded integrated swim platform of the 341 and take a tour. Past the transom storage locker and one step up from this platform on the starboard side and through the molded transom door takes you into the cockpit with its built-in two person upholstered transom seat and room for two portable deck chairs. A curved, molded staircase leads from the port side of the cockpit up to the huge bridge deck with a rear overhang which virtually covers and protects the entire cockpit below. 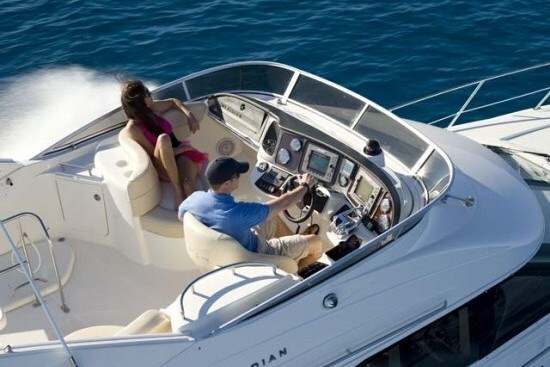 Seating for seven adults is provided on the bridge with an adjustable single helm chair for the captain on the starboard side conveniently located just about midship along the length of the 341. 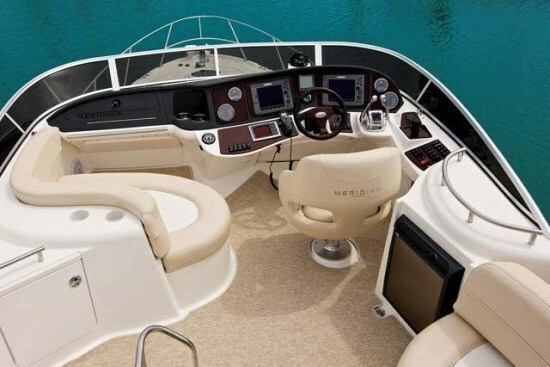 A double contoured seat is provided opposite the helm seat on the port side and a four person L-shaped lounge seat fills the aft and starboard side of the bridge with molded storage cabinets on both sides. 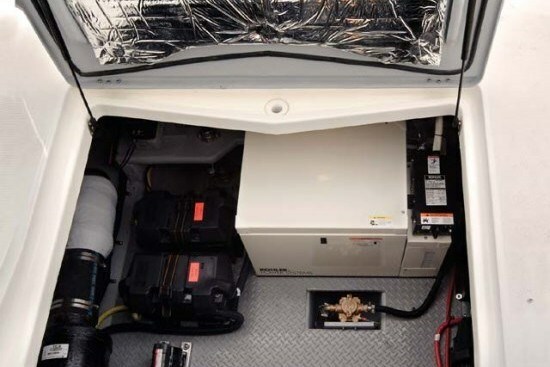 Mercury's SmartCraft™ vessel integration technology monitors performance diagnostics and can assist in trip planning for instance by estimating how far a tank of fuel will take you and provides guidance on operating your vessel for efficient fuel use. A fibreglass radar arch is standard on the bridge as are helm and seat covers, a bimini top, plus a closable hatch cover over the staircase leading down to the cockpit. This is a great safety feature. A sliding glass door with optional stainless steel frame and roll screen leads from the cockpit to the very bright one level salon with 360° outward visibility via the windshield plus the opening side windows plus a second lower level of side windows providing a view outside while seated or standing. Headroom here is 6’5”. 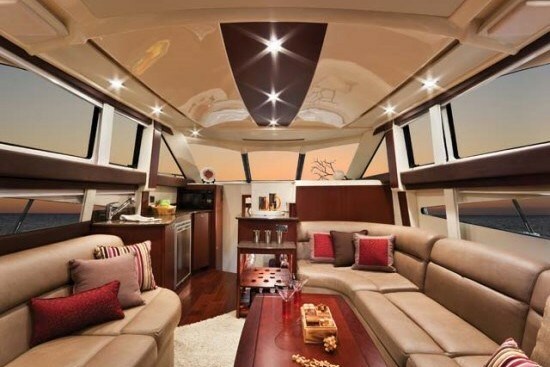 Standard Ultra® Leather coverings add a rich texture to both the aft portside two-seater lounge, which is optionally available as a Magic Bed®, and to the aft starboard side Flexsteel™ L-shaped lounge with double incliners. A hi-lo table fits neatly on the carpeted floor between these two lounges. A custom décor pillow and designer package is standard along with a 19” television and bottle storage cabinet. Central vac, two-zone Ultra-Flow™ Comfort air conditioning, electric heat, and gloss finish natural cherry wood are optional as is a lower helm station. 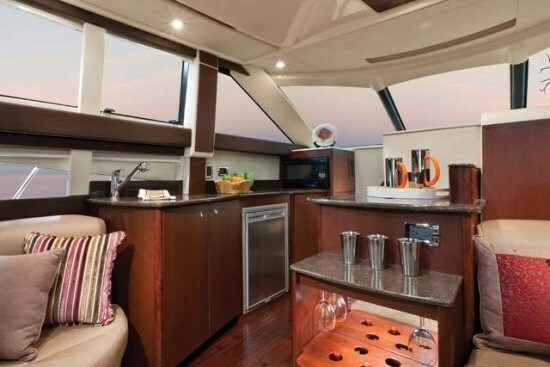 The forward port side galley on the same level features solid cherry construction, natural hardwood flooring, Karadon™ solid-surface countertop, rolling pantry cabinet, microwave, under-counter refrigerator/freezer, and recessed electric cooktop. Three steps down and forward finds a forward master stateroom with an island pedestal double bed, two hanging lockers, designer fabrics with cherry wood, and a 19” television. 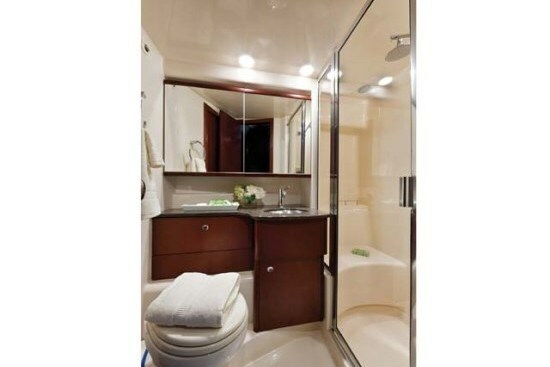 The head to starboard provides private access from the master stateroom or from the central companionway and features a separate shower stall, and VacuFlush® head. 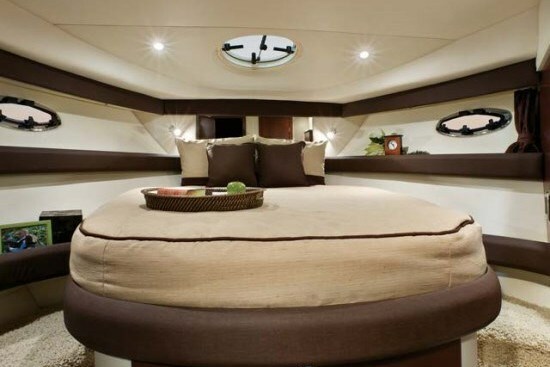 Aft, under the salon and ahead of the inboard engines is a private guest stateroom with two twin beds with a centre filler cushion to convert this arrangement into a queen. 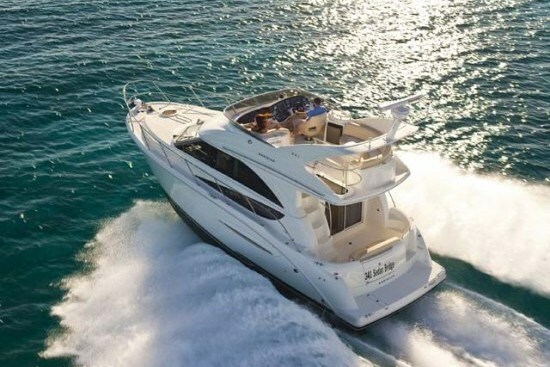 Additional notable options you may wish to consider for the Meridian 341 include a gas (or diesel) generator, Northstar® or Raymarine® Premium navigation electronics, autopilot, full canvas bridge enclosure, exterior carpet, a cocktail table for the bridge, and a foredeck sunpad.